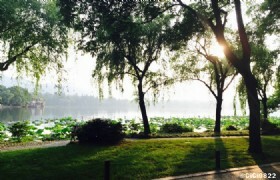 Located in the ancient downtown of Suzhou Guanqian Street is famous as one of the major leisure and shopping streets and one of the popular attractions in Suzhou. 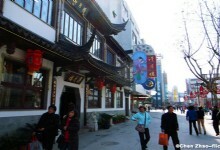 Guanqian means in front of temple in Chinese, and Guanqian Street gets its name “Guanqian” as the street stands in front of the ancient and famous Taoist Xuanmiao Temple. Guanqiang Street is themed at shopping, eating, leisure and entertaining and attracts many local people and tourists there every day. There are hundreds of shops, stores, restaurants, bars, cafes and clubs located in the street to provide all-round services. Shopping at this ancient commercial street, you can buy a lot of items from ancient crafts like silk-made items, paintings, antiques and embroiders to modern items like clothing, shoes, handbags and accessories. 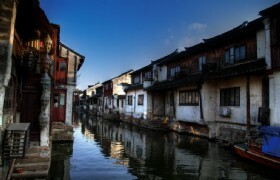 And there are shops that sell local Suzhou specialties, thus Guanqian Street is also considered as a tourists shopping street.